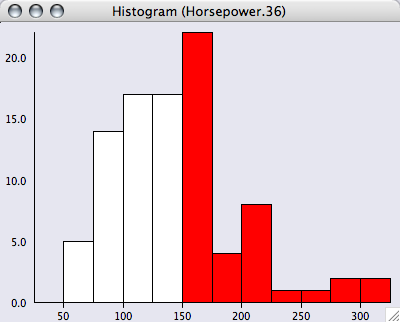 iPlots is a package for the R statistical environment (see www.r-project.org) which provides high interaction statistical graphics, written in Java. It offers a wide variety of plots, including histograms, barcharts, scatterplots, boxplots, fluctuation diagrams, parallel coordinates plots and spineplots. 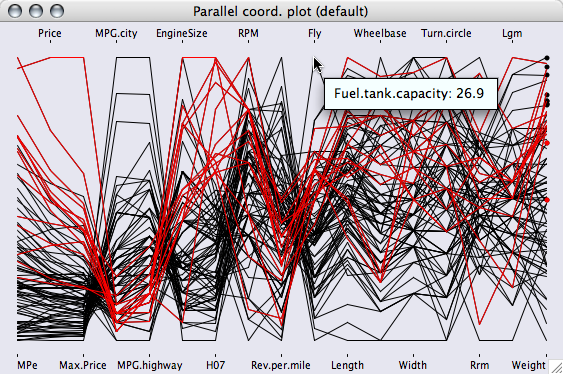 All plots support interactive features, such as querying, linked highlighting, color brushing, and interactive changing of parameters. The iPlots package was introduced at the DSC-2003 (http://www.ci.tuwien.ac.at/Conferences/DSC-2003/). The various additions of Version 2.0 were introduced at the userR!2006 Conference (http://www.r-project.org/useR-2006/). 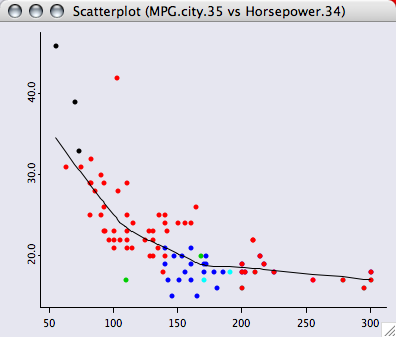 Besides interactive plots, iPlots also provides an API for managing plots and adding user-defined objects, such as lines or polygons to a plot. Version 2.0 not only adds new multivariate plots and interactive features throughout all plots, but also lays the foundations for interactive customizable plots (ICP). 2009/07/01 the current development version can be found here. The initial release is planned for September this year. 2009/04/29 iplots eXtreme will be presented at the useR!2009 and the DSC2009 meetings and released soon after. 2007/08/07 Released iplots_1.1-1 on CRAN. iSets and iVars are now fully transparent objects and support all usual opeartions like indexing subsetting etc. as well as sub-assignments. The latter will use hot-linking, i.e. any changes to the data are immediately reflected in the plots. See ?iset and ?ivar in R. Mac users can now use iplots in the console and R GUI (although somewhat limited) - JGR is still the recommended way. 2007/04/18 Released iplots_1.0-8 on CRAN. Added initial support for (geographic) maps. 2006/10/11 Released iplots_1.0-5 on CRAN. Beside several bugfixes and improved documentation it also features support for variable-length arguments (e.g. imosaic(AirBags, Cylinders, Origin) and a more sophisticated registration of iVars which prevents variable duplication. 2006/10/03 Launch of new website, more documentation will be added gradually. 2006/08/20 Release of iplots_1.0-3 (Version 2.0) and binaries for R 2.3.1.
iPlots are now also officially available from CRAN. 2006/05/05 Released iplots_0.2-1 (including Windows and Mac binaries for R 2.3.0) to go along with JGR. Please note that iPlots are under continuing development now and features are being added on a daily basis, so you may want to update the package evey now and then even if there is no official release. The next major release is expected for useR!2006. 2005/01/25 Updated webpages; latest versions of iPlots are available from our R repositories and binaries as a part of the JGR distribution. 2004/06/26 iPlots are now by default delivered with JGR (Java GUI for R). It is recommended to use iPlots with JGR, because iPlots are seamlessly integrated into JGR. View menus need to be cleaned up and consolodated with the context menus. 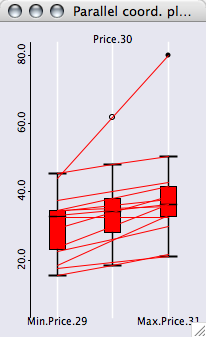 More plot parameters need to be exposed on the R level. Some plots on some platforms do not update properly after creation. Mosaic plots in iPlots are fully interactive, i.e. they not only allow standard selection, highlighting and color brushing but also reordering of variables and the addition and exclusion of variables. To switch between the different representations, use the context menu. All variations have their particular strengths and weaknesses, so you will need some experience to use them most efficiently. To rearrange the variables use the four arrow keys ... you will soon get the idea of how to manage the variables! Since most attempts to optimally place labels on mosaic plots fail sooner or later, we use a simple linear spacing for the first variables. Any further information should be queried using <ctrl>-mouse-over. Bars can be reordered either by using the options in the "View" menu or by <alt>-dragging a bar to its desired position. 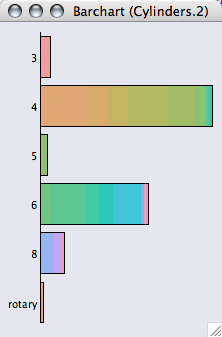 iPlots respect the order of a factor, so orderings from within R can be used to order the categories in a barchart. "Driver & Passenger" "Driver only"    "None"
 "None"               "Driver only"    "Driver & Passenger"
Interactive maps - which use the data-format of the maptools package - will be availabe soon! There is a whole family of parallel plots in iPlots. 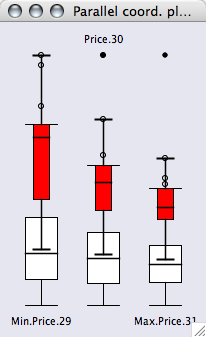 A parallel coordinate plot connects all cases by lines. The default plot will scale all variables individually between min and max. Most other options are general options and will be discussed in the conventions section. Parallel boxplots are quite similar to PCPs but feature statistics like the median and the hinges, which makes them more useful for comparing distributions of variables. Parallel boxplot for the three prices in the dataset. Each variable uses the full range. 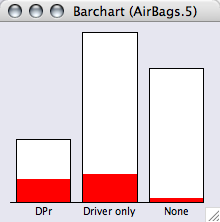 Showing only selected cases with the corresponding lines. All options can be found in the "View" menu of the plot. 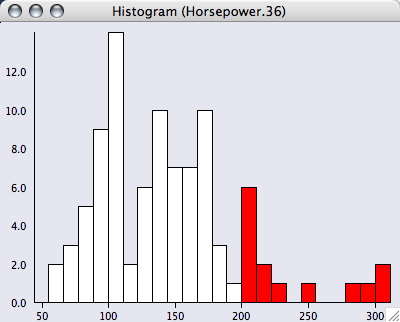 This example shows nicely that all cars having more than 200hp (this is the selected group) have either 6 or more cylinders or a rotary engine. 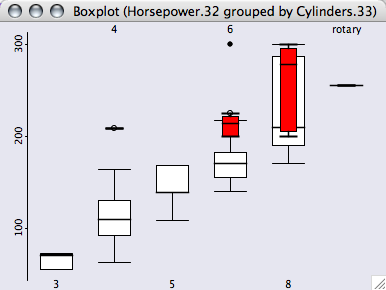 Obviously, a boxplot y by x always uses the same scale for all boxplots for a proper comparison. 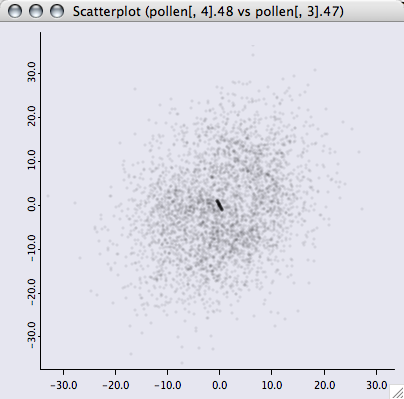 The scatterplot is probably the most frequently used plot of all statistical graphics. 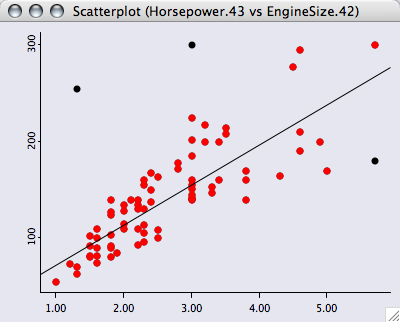 Scatterplots in iPlots can be used in the same way as the standard scatterplot in R.
Looking at the above example, a natural step would be to add a scatterplot smoother to the plot. # and rerun the lowess and plot it again. 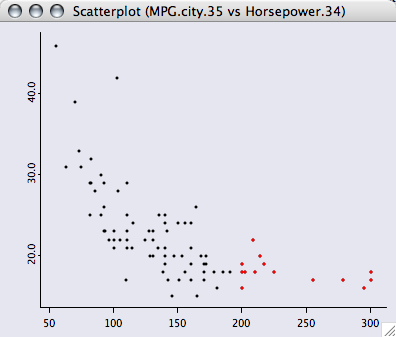 Many other options for the scatterplot within iPlots can be found in the "View" menu. 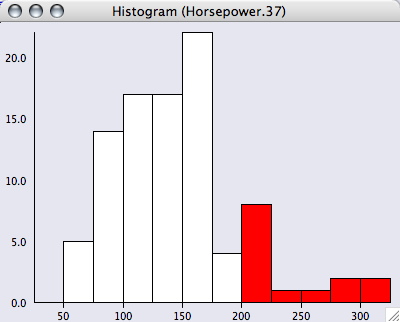 Histograms in iPlots are fully interactive and can also be switched to the spineogram view. 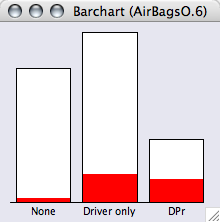 Binwith and anchorpoint can either be changed interactively by <alt>-dragging the leftmost interval border (anchorpoint) or any other bin break (binwidth), or by explicitly specifying the two parameters via iplot.opt() or when creating the plot. 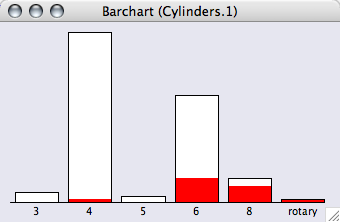 Histograms rescale by default when their parameters are changed, which can be controlled by two flags (see the help pages for details). Selection in all iPlots can be done via selecting single objects like a point, a bar/rectangle or a line, or by creating a drag-box, which selects all points within the rectangle. Via the iset-functions, the selection state of an iplot session can be queried and modified. # what proportion of the dataset is selcted? All plots, which share the same iset are updated immediately. 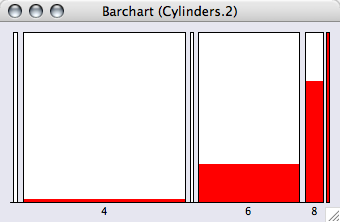 To perform more complex selections, pressing the <shift>-modifier will select data in XOR mode. Selections are a transient attribute of the data. Whenever a new selection is defined, the old selection state is overwritten. A persistent color attribute can be defined using color brushing within iPlots. Color brushing can either be applied via the col=... option in iplot.opt() or any other iPlot graphics, or via the "View > Set Colors (CB)" menu command. 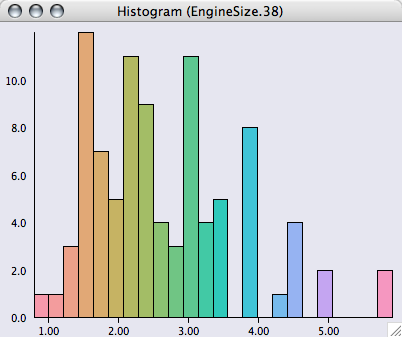 A second option for using color brushing is to apply rainbow colors over the range of a continuous variable. The menu command "View > Set Colors (rainbow)" will set the color scheme. 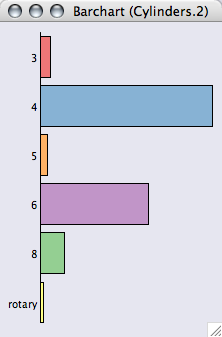 Not really a good model, but at least we got rid of the outliers very easily. There are some housekeeping functions for iObjects (please refer to the help files for details). Interactive graphics benefits strongly from an interface which is highly consistent and has a flat learning curve. The most important functionality within iPlots are the keyboard shortcuts and modifier keys. Many other common functions can be found in the "View" menu. The handling of iPlots is done via a set of maintenance functions (see help files for details). 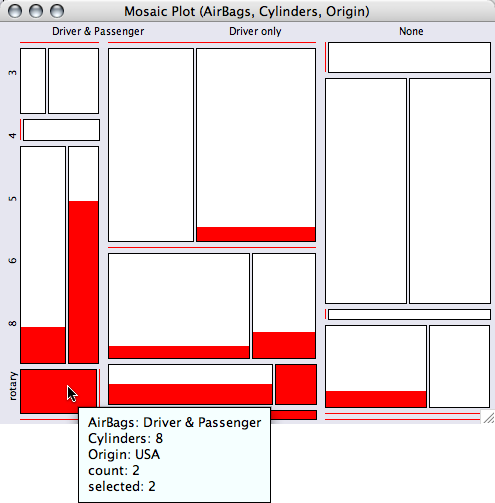 The basic concept follows the handling of devices within R. It is, however, advisable to use plot objects directly, especially in scripts. The same principles are used for maintaining the so called isets, which are the datasets defining case linking in iPlots. The α-channel can be used to specify the transparency of a painted object. 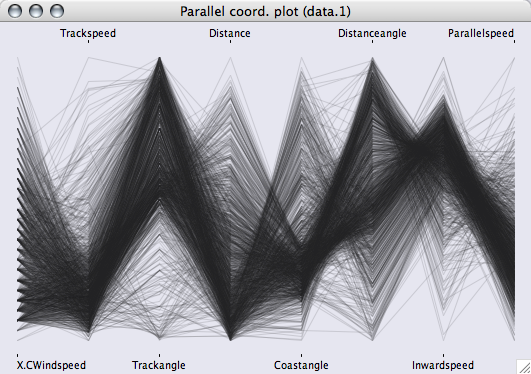 This is useful, when plotting very many objects , which would otherwise result in heavy overplotting. Thus the density of objects can be easily displayed. All glyph-based plots in iPlots offer α-channel transparency to handle large data and avoid overplotting. Use the arrow keys (left and right) to interactively increase or decrease the transparency. Where can I download iPlots? Is there anything else I need to install in order to use iPlots? iPlots needs SUN's JRE to run. For Windows and OS X it is recommended to use at least Sun Java 1.4 or higher. For other UNIX operating systems (in particular Linux) Sun Java 1.5 or higher is highly recommended (64-bit Linux requires at least Java 1.6 beta). For the best user-experience, iPlots can be run from within JGR. rJava fails to load on Unix, what can I do? Please post questions and bug reports to the mailing list stats-rosuda-devel. Issues of general interest will be posted on this page.